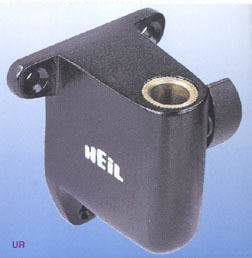 The Heil WM-1 is a unique mount for the Heil booms on a vertical surface. A brass insert insures smooth perfect fit. The WM-1 affixes to the wall via three supplied screws. It is a great match with the Heil PL-2T, HB-1 or SB-2 microphone booms. The WM-1 is about 2.75 inches wide, 3 inches high and extends 2.75 inches from the wall. Copyright 2004-2011, Universal Radio, Inc.